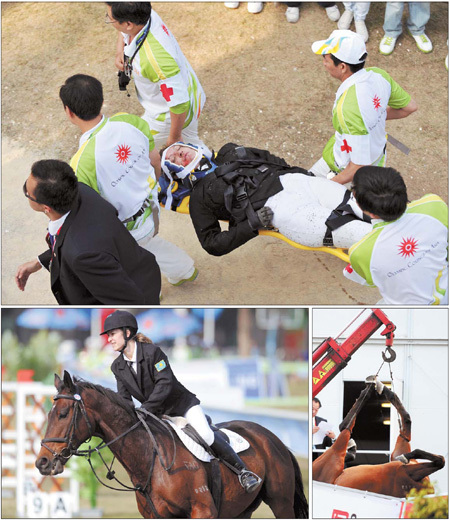 GUANGZHOU - Tragedy rocked the Asian Games on Tuesday when a horse died from a neck injury following a spill that left rider Galina Dolgushina of Kazakhstan hospitalized. Dolgushina was close to completing the course in the equestrian portion of the women's individual modern pentathlon when she was suddenly thrown forward and pinned by the horse's body after it caught a hoof between two railings. The unconscious rider was taken by ambulance to a nearby hospital, where her condition was later upgraded to stable and she was able to talk to her father, according to the International Union of the Modern Pentathlon. Immediately prior to the spill Dolgushina appeared to be having difficulty handling the horse, which twice failed to jump over the course barrier and repeatedly kicked at other obstacles. Gravely injured, the horse was examined by veterinarians behind an improvised screen that shielded the scene from the large crowd. The horse's carcass was loaded into a van and removed from the venue at 4:25 pm. The interruption lasted about 40 minutes before the competition was resumed. Tan Yongqiang, secretary-general of the modern pentathlon discipline, confirmed the horse was not euthanized but expired as a result of its injuries. 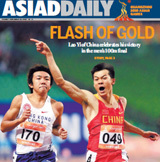 The animal was a nine-year-old retired racehorse presented by the Hong Kong Jockey Club to Guangzhou for the Asiad. Guangzhou's Bilture Horsemanship Club helped with its training. All horses in the competition were required to pass four physical examinations beforehand, according to Li Chungang, competition manager of the modern pentathlon arenas at the Guangzhou Olympic Center. "What has happened is unfortunate, but all competition contains risks," said Li. "What happened this afternoon was entirely accidental." For modern pentathlon, horses are selected by random draw 20 minutes prior to the start of competition. "We feel very sorry about the accident, but sports events are full of dangers. And we can't change the rules because of this incident," said Dr H.C. Klaus Schormann, president of the International Union of Modern Pentathlon. "While we are all sorry about the horse, we should feel fortunate that the athlete wasn't injured more seriously." The accident stirred memories of the 2006 Doha Asiad, where a Korean rider and his horse were killed in a crash. "It was traumatic to recall the Korean athlete who died in Doha," said Choi Kui-sung, second vice-president of the International Union of Modern Pentathlon. "But I agree with our president that we won't change our rules about the course."